It’s not ski season yet! 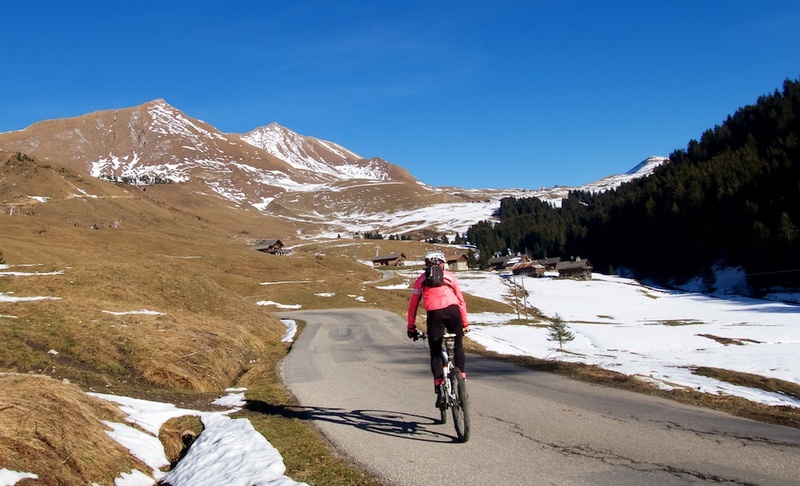 A very fun ride up the super steep (paved) Col des Annes, then an unpaved traverse through some Le Grand Bornand ski slopes into the next valley, and finally a quick dash up the currently closed Col de la Colombière. 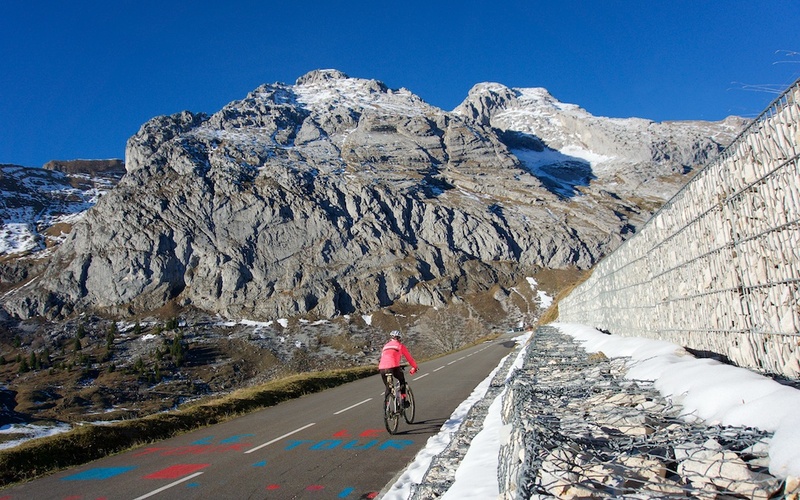 Beyond dressing appropriately, the best advice for cycling in the Alps in winter? Pick south/west facing climbs (low sun means dark/cold north-facing roads), wait for a sunny day, and no recent snow. Col des Annes is one of the highest paved roads in Haute Savoie (1721 metres) – the super high north French Alps stuff is further south in Savoie. It is a dead-end side road that starts in Le Grand Bornand – on the Route des Grandes Alpes. .
It’s very steep, but quiet and scenic. In summer there are a couple of nice restaurants at the summit and hiking everywhere. It was cold, but sunny. It hadn’t snowed in some time and I was hopeful the route would be open to the col. The first few easy kilometres pass the cross country skiing and biathlon area, then the road turns up. Tough. On the right (south) the Aravis Alps towered above. Beautiful. After some hairpins, the route straightens out and the Col is visible in the distance. 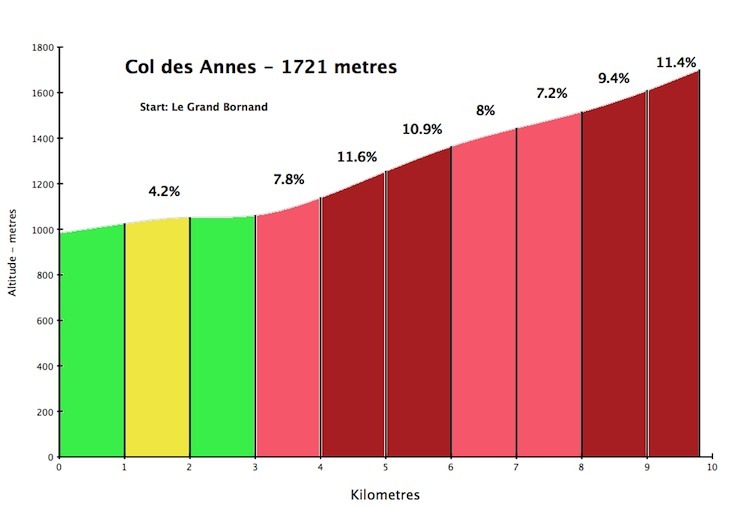 The paved road ends at Col des Annes, although – in summer – it is possible to descend the far side on a mountain bike to Reposoir (half way up Col de la Colombière north side). But it’s tricky and technical – requires some hiking. See here. This gravel road eventually joins the main Route des Grandes Alpes road perhaps 3 kilometres below the summit of Col de la Colombière. The road up to Colombière was closed here but it was completely clear, so I continued higher. 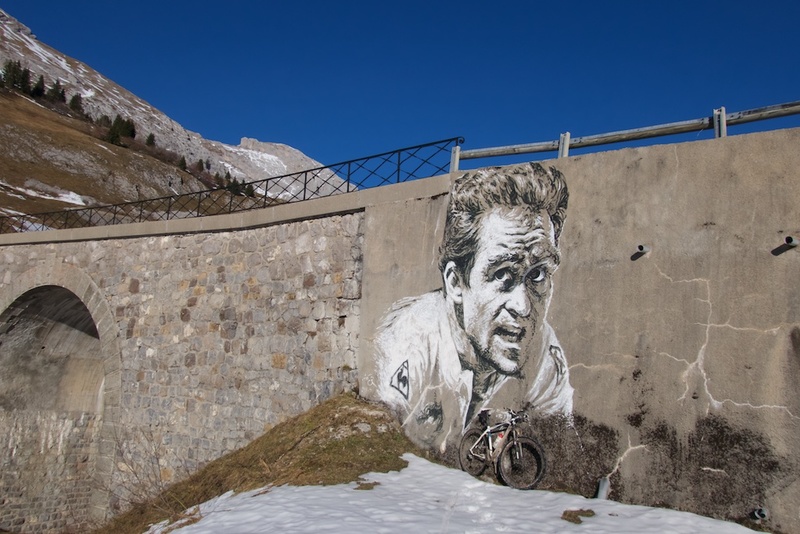 Perhaps 1.5 kms from the summit I passed some great artwork on a bridge. A young Bernard Hinault! There were a few shaded sections where the road was completely covered in snow. But all were very easy “portages.” Woohoo, a traffic-free road. Finally, I just descended back down the main road back to Le Grand Bornand. 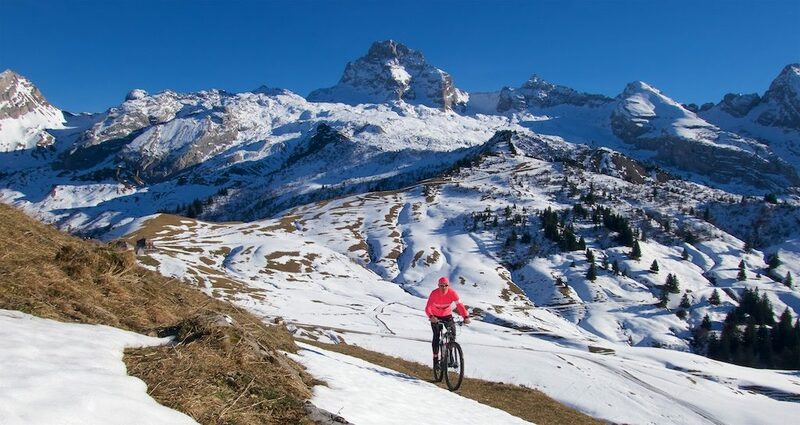 Cycling the Alps in winter takes some planning. I had a good foot/finger strategy, I had waited for perfect weather, and I was ultra cautious on various slippery/ice stretches. 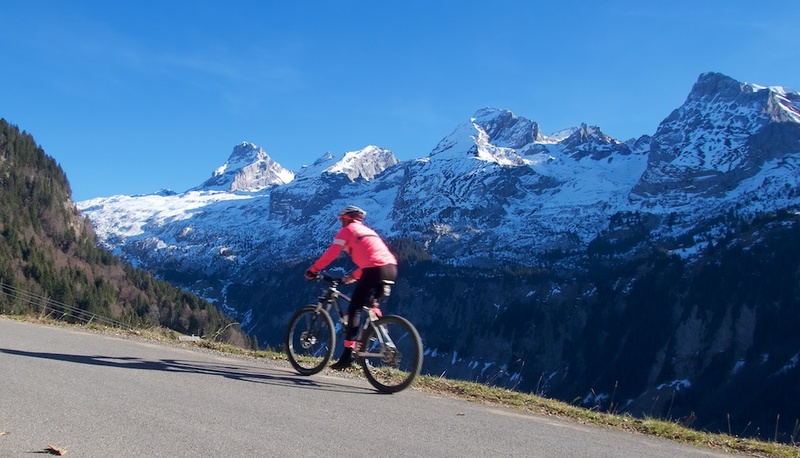 But on a day like this, winter cycling is special.